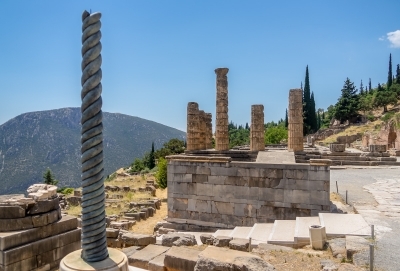 The Archaeological Site of Delphi comprises the remains of a sanctuary that was the "navel of the world" and had a huge impact on the ancient world. Delphi reached its height in the 4th century BC, when large numbers of pilgrims came to ask advice of its oracle. The oracle, an old priestess, was believed to be Apollo's mouthpiece. She answered the visitor's questions (via a priest), inhaling the fumes of a chasm. In return, the pilgrims brought lots of votive gifts to the temple. Also city-states like Athens and Thebes contributed with treasuries and statues, thanking Apollo for supporting them in wars. 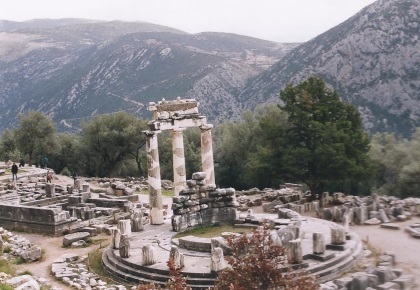 Delphi's fame dwindled in 191 BC, when it was taken by the Romans. It was totally closed down in the 4th century AD by Theodosius, who wanted to get rid of the pagan sanctuaries. Finally, after 10 days being a lonely visitor to Ancient Greece, I saw them: The Crowds. On Sunday all archeological sites have free entrance, and a lot of Greek families take this opportunity. Also quite a number of foreign tourists - maybe because of Delphi's relative proximity to Athens. Ancient Delphi was built against a mountainside. An impressive setting, though not much remains. A steep walkway connects the monuments - The Sacred Way. This was once littered with gifts by graceful city-states, and made a promising entrance to the temple of Apollo. Highlight nowadays is the sanctuary of Athena, across the street from the main site. 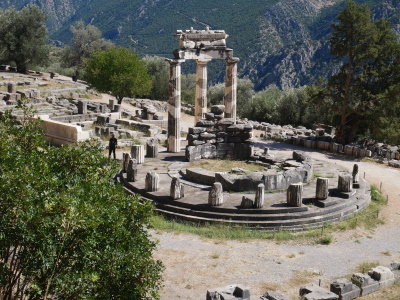 The graceful "tholos" there features on many Delphi-pictures (including mine). Delphi was the sacred center of the world for the Ancient Greeks and undoubtedly a remarkable achievement of purposeful architecture, a sanctuary built into the challenging landscape to inspire awe and worship. Unfortunately, very little is left of its former glory, and the visual impact is fairly muted. Having experienced grandiosity of the Parthenon at Acropolis or the vastness in various states of preservation at Delos, it is hard to see Delphi as little more than a sequence of terraces with few surviving features here or there. Of course, you may be more into archaeology than I am or simply more attuned to the aura of the great legacy that the Ancient Greece bestowed on the mankind, so the simple fact of being in such an important and symbolic place may give you additional satisfaction. The focal point of Delphi is the Temple of Apollo, undoubtedly photogenic, backed by the views over the valley of Phocis. Among other defined points are the Athenian Treasury, the theater, and the stadium up the mountain. The higher you climb, the more sweeping the views become, but in reality climbing more than a terrace or two above the Temple of Apollo is worthwhile only if you are looking for some mountain hiking. Delphi is located in the administrative region of Central Greece about two and a half hours drive from Athens. An hour appears sufficient to explore the core of the site (for aforementioned hiking, add another hour). The archaeological museum is a short walk from the site along the main road and is accessible for a separate fee (or on a combo ticket); allow one more hour if you want to view its collection. I visited this WHS in June 2014. It's one of the most crowded sites in Greece. However, most tour groups gather mainly in the shade of the trees near the Temple of Apollo and in the archaeological museum of Delphi, afraid of the scorching sun. Most don't even visit the theare and the stadium that are high above the Temple of Apollo. These were my personal favourites as they offer great views of the surrounding mountains and a great panoramic view of the Archaeological Site of Delphi. About 250 metres away, I visited the Ancient Gymnasium and the Athena Pronaia Sanctuary which has the famous tholos (picture). All in all a great classical site but not the best Greece has to offer. i've been to greece with a friend last october. it was quite an experience. 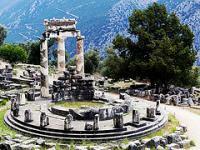 we planned places to visit ahead of the trip and DELPHI is definitely on top of the list. it is really worth it to visit this place. the town itself, though small is very interesting and captivating. and the walk going to the mountain is absolutely exciting. i have read a lot of books regarding greek mythology and it is really a wonderful experience to visit places such as DELPHI because i somehow was able to visualize the stories seeing the ruins where these stories took place. DELPHI is 3 hours by bus from athens and paid 13ueros for one way ticket, 9euros for the museum and archelogical site entrance fee (but free for sudents). a guide is not necessary if you know a little of greek history and mythology. weather on october in greece is absolutely perfect for the trip! The setting of this place is wonderful with its ruins, mountain backdrop, and vista down the deep olive tree strewn valley to the sea. The ruins are often photographed and described. What seems to be a secret are the remains of the stadium in the upper portion of this site. The banks of seats on the northern side and the starting blocks in the stadium field are very well preserved. This stadium is the best I have ever seen, except for the one at Aphrodisias in Turkey. Delphi is indeed a lovely day trip from Athens. The Temple of Apollo is quite impressive and I'm glad I had a panoramic camera to capture the structure. The theatre (or stadium) is also spectacular. It's worth your time to go through the Delphi Museum. I was naughty and took a flash photo of the Charioteer of Delphi. It came out blurry (serves me right) but the statue had quite an impact on me during my visit. Delphi is one of those places whose ancient importance cannot really be seen today anymore, just felt and imagined. It is located in a beautiful mountain setting, on the Parnassus Mountain, and its remaining monuments don´t quite reflect its extreme significance in ancient Greece, when it was the site of its most important oracle and the "centre of the world". Many of the buildings and temples are similar to others all over Greece, but the walk along the Sacred Way is really special, and the setting of the site is unique. Definitely worth a visit when you´re interested in ancient Greece. Participating in “organised tours” is not really my favourite way of travelling. But sometimes there is an arrangement where the hassle of getting to your destination might become too much compared to signing up and paying a couple of Euros to a company with a ready-to-go-tour. Making an excursion to Delphi from Athens is exactly such a tour. Getting to Delphi by car is of course a non-issue but with only public transport as option it becomes quite a complicated task. So it was not long before I found myself in one of those comfortable air-conditioned bus with a guide constantly mumbling a lot of gibberish in broken English to an audience of half-asleep tourist due to the early morning departure time. After first making its way through a quite boring Greek landscape we reached the first mountains after a couple of hours driving. And suddenly the trip took on a more exciting perspective - in which turn is the bus going to drive off the road and tumble down in the valley…? Now, not now, now….considering how they drive in Greece I’m amazed that there are no more cars and other motor vehicles lying in heaps on the side of the roads? Having reached Delphi, one immediately notice how beautifully located is sits on the mountainside and it is said that when Zeus released two eagles from opposite ends of the world, their paths crossed in the sky above Delphi, establishing Delphi as the centre of the world. And on what was a very hot summer day (over +40), I stumbled out of an air-conditioned tour bus and almost collapsed in the sudden heat. After pouring a bottle of water over myself I proceeded up the Sacred Way, leading up to the temple and a beautiful view over the valley beneath and the mountains across. It’s a magnificent site that makes you think of solitude and contemplation and the fact that this also was the site for the famous Oracle is quite fitting. Delfi is well worth a visit when you’re in Athens. And after touring the temple site you can easily walk the 250 meters north and you will reach the small town of Delphi, bursting with souvenir shops and good restaurants to end your day in a beautiful part of Greece. 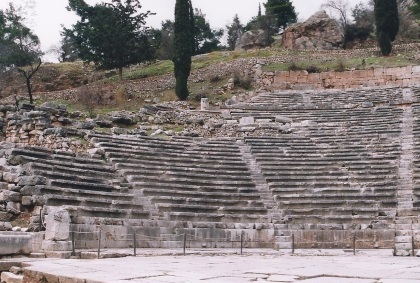 Theatres: Wiki: "The ancient theatre at Delphi was built further up the hill from the Temple of Apollo giving spectators a view of the entire sanctuary and the valley below. It was originally built in the 4th century BC but was remodeled on several occasions since. Its 35 rows can seat 5,000 spectators." 269 Community Members have visited.